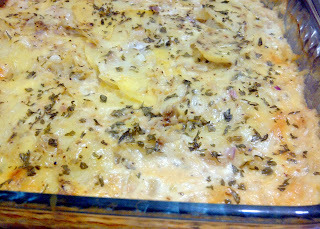 I served this potato gratin with my Chicken Paprika Straganoff as a side-dish, however, if you are in the mood, you can have the potatoes on their own! They are that good, and the best part about making it at home is that you can have as much as you want (or as much as there are leftover). This is indulgent comfort food at its best, and it tastes great in the winters when it comes hot out of the oven, with a bubbling cheesy crust on top. You might feel like eating salads the next week to compensate, but this dish is worth it. P.s. Make enough so that you have leftovers for the best midnight snack! Ovenproof Pyrex is a good option as it can be served directly on the table. Note: The initial recipe called for about 2 cups cream, and 1.5 cups of cheese, but I decreased both because while I am sure it would have tasted delicious, there was a little bit of guilt. You may increase the cream & cheese, but do reduce the milk accordingly. 1. Heat oven to 180 C.
2. Melt butter in medium saucepan. Saute onion for 2-3 minutes till soft and translucent. Add garlic and saute for about 30 seconds till you can smell the garlic. 3. Add cream and milk and heat until its hot. 4. Start layering the potatoes & cheese in a baking dish making sure to end the top layer with cheese. Sprinkle every layer of potato with a bit of salt, pepper, herbs, and then cheese. 5. Pour in the cream and milk mixture over the potatoes making sure that it comes up at least 3/4th of the way up the potato layers. 6. Put in the oven and cook, until the potatoes are tender and the top is browned, about 45 to 50 minutes. 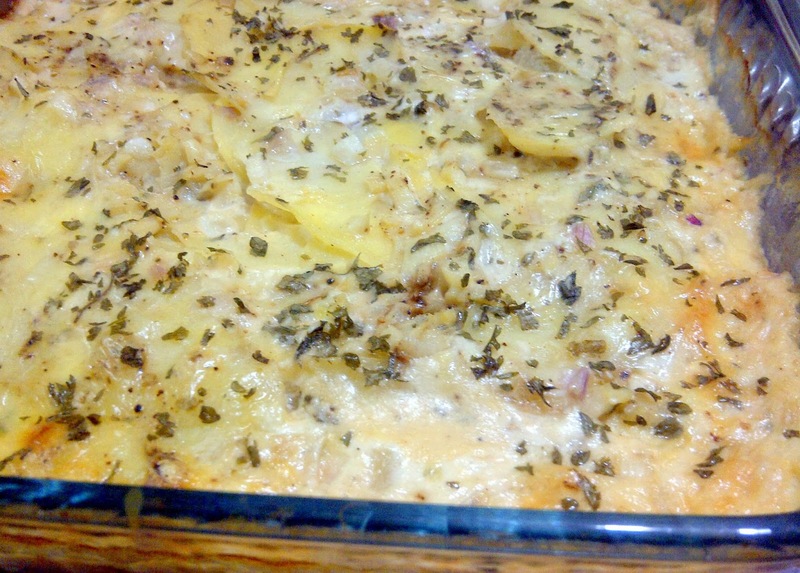 Check by inserting a knife in the potatoes, and if it meets little or no resistance then the gratin is done. Note: The cooking time will differ based on the thickness of the potato slices so check accordingly.